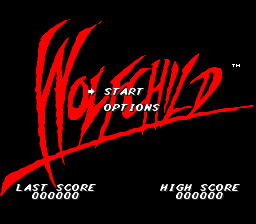 Wolfchild (ウルフチャイルド) is an Amiga platform game by Core Design ported to the Sega Mega Drive, Sega Mega-CD, Sega Master System and Sega Game Gear. Saul Morrow is the son of a scientist whose biological weapons expertise leads a terrorist organization (called the Chimera in the Mega-CD version) to kidnap him and kill his wife and older son. After discovering this, Saul takes it upon himself to save his father, using his father's latest project, Project Wolfchild, to transform him into a wolf-man that can shoot energy blasts when he gains enough power. attacks (punching when powered down, shooting an energy blast when powered up). jumps. launches a smart bomb that you collect during levels. There are also various other powerups whose purpose are unknown (TODO). The layouts of stage 2 and onward have been heavily modified for the Sega Mega-CD version.